Campaign for the American Reader: What is Tania Hershman reading? The current featured contributor at Writers Read: Tania Hershman, author of the short story collection, The White Road and Other Stories. 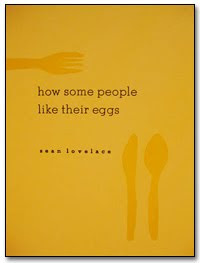 I've just finished reading Sean Lovelace's How Some People Like Their Eggs, a slim chapbook of flash fiction published by the excellent Rose Metal Press. I love flash fiction, short short stories of only a few pages which, when done well - and here they really are done well - make you wonder why anyone ever needs to take 250 pages to tell a story. Lovelace's imagination knows no bounds, his stories are tragi-comic and they leave an impression that does not fade. I read this collection for review for The Short Review, the journal I edit, I find many new favourite writers this way! Tania Hershman is a former science journalist. Commended by the judges of the 2009 Orange Award for New Writers, her short story collection, The White Road and Other Stories, is published by Salt. She is the founder and editor of The Short Review, and incoming fiction editor of Southword. "THE title story in this book is everything fiction should be: inspiring, moving, comical, provocative and heartbreaking - and all that in just seven and a half pages. The rest of the stories in this collection are similarly remarkable. Some are also remarkably short: Go Away is, essentially, a well-told joke (and laugh-out-loud funny). Hershman's economy with words cloaks her subtlety and power, though: a second reading uncovers hidden moments in each story. Inspired by scientific progress and science journalism, including articles in New Scientist, and driven by an author dripping with talent, this is as good as modern reading gets." "It shattered my pre-conception that 'I can't get into short stories.' Some of it is flash fiction, which is quite new to me, and I'm loving it. And flash fiction really suits the modern need for short and snappy reading experiences. If you only want to read one, read the first story, the eponymous one. It will sear your mind and you won't forget it." The publisher has made The White Road and Other Stories available at a special 30% discount from their online shop at www.saltpublishing.com. Visit the book's page on the site, then enter the code GM18py7n when checking out. Visit Tania Hershman's website and blog.